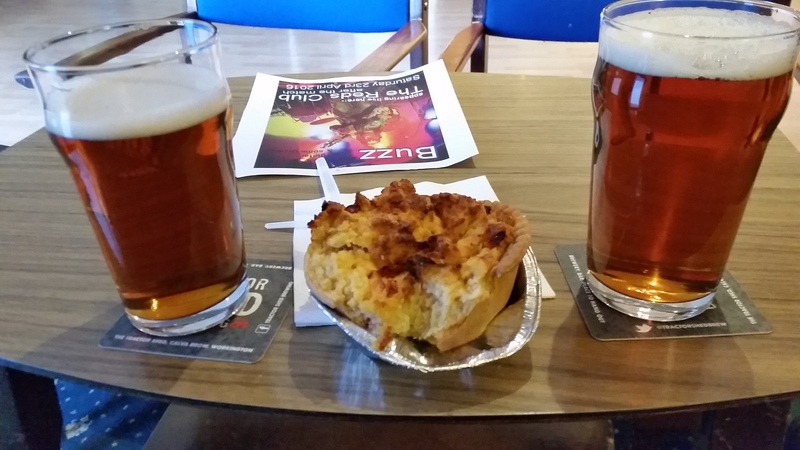 Comments: The Euro 2016 final is around the corner so here’s a pie review as far removed from the glitz and glamour of a Paris final as intergalactically possible – a pie from Cumbria based Northern Premier side Workington AFC. Back down to earth, back to real football, back to rickety turnstiles, golden goal tickets and divots galore. Workington’s two great claims to fame are that they were once managed by Liverpool legend Frankly Bill Shankly and that slippy hands “oops there goes the ball” Scott Carson honed his skills at Borough Park. After a season of watching Fulham’s abysmal attempts at football, a trip to the non-league felt like a refreshing trip back to basics. 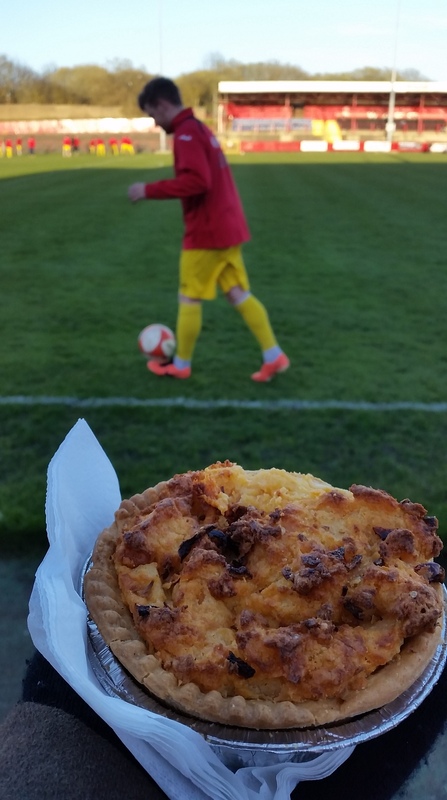 In true non-league style I grabbed a pint of frothy local ale and bought a homemade looking pie concoction from a lovely dinner lady operating out of a canteen. From the outside the pastry looked all the world like a pie, but actually it turned about to be a strange mutation between a quiche and a pie. On top a jagged ridge of crusty, crisp potato sat like a noble crown. Inside the the mushy yellow blend of carbs galore, with the odd string of veg, complimented the crisp roofing. Although on the stodgy side, the pie was a novel move away from the usual boring old balti and stale steak. A dash of gravy would have gone a long way to moisten the hefty load, but the impracticalities of carrying a gravy boat through the terraces are self-evident. To compliment the homemade pie was a thrilling game of good old fashioned footie. It had it all; penalties, crunching tackles, near-misses, plenty of hoofs and a hattrick from goal machine Scott Allison. No nancy boy dives or feigning injury, just full blooded commitment from both sides. So when you see Ronaldo lolling about the floor or Giroud tumbling on his arse with the waft of the wind in Sunday’s final, remember Workington AFC is offering ale, pies and proper football all year round.